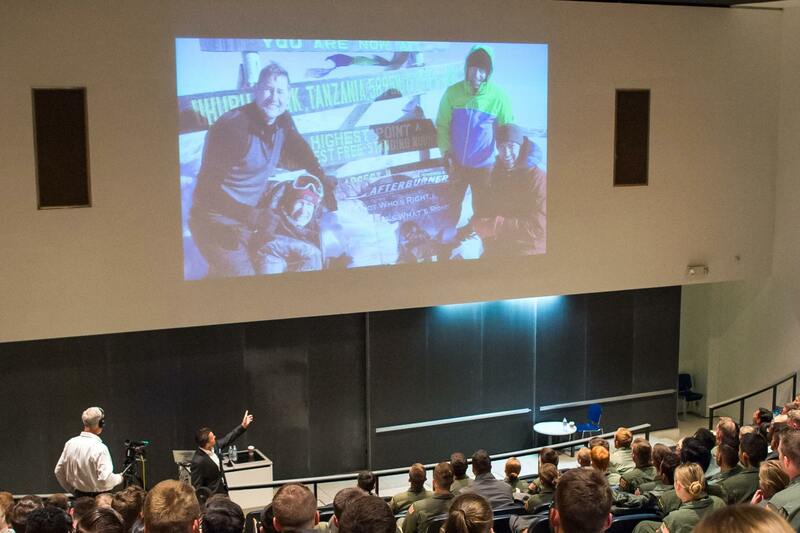 U.S. AIR FORCE ACADEMY, Colo. — Three Air Force Academy graduates spoke to cadets at Fairchild Hall about their Air Force careers and the leadership techniques that made them successful in-and-out of uniform Sept. 28. Joel Neeb, a former F-15 pilot; Otis Hooper, a former C-40 VIP and KC-135 pilot; and Michelle Ruehl, a former MC-12W pilot and professor of English at the Academy, are all members of Afterburner, Inc., a consulting and coaching firm teaching military skills and leadership philosophy to chief executive officers and corporations. Neeb walked the cadets through his journey with stage IV cancer. His diagnosis, he said, came at the pinnacle of his career as a lead instructor pilot at Randolph Air Force Base, Texas, where he had recently been considered for a position on the Air Force Thunderbirds Aerial Demonstration Team. Neeb got back into the cockpit, a milestone that made him the first Air Force pilot to be diagnosed with stage IV cancer to return to flight in a single-seat ejection aircraft. He also started an outreach program for kids, completed an Ironman Triathlon in New Zealand and competed on a televised obstacle course show with competitors half his age. He told the cadets not to “celebrate mediocrity,” and shared how remorseful he was that he didn’t try harder as a cadet. He said ‘now is the time’ for the cadets to start building their leadership brand, a brand that will follow them into their Air Force career. “What do you want to be known for?” he asked the audience. Hooper charged the cadets to lead themselves first, focus on maintaining a healthy life-work balance, and walked them through the importance of goal setting and a commitment to something greater than themselves. Ruehl said it was the out-of-the-box thinking and determination she learned at the Academy that set her up for success while deployed to Afghanistan and when tackling cross-cultural barriers throughout her career. Finally, the group highlighted the value of the skills cadets learn at the Academy and in the military. Even something as simple as conducting a mission debrief, they argued, is a useful tool that pays dividends in a corporate environment where their peers might not have those skills. Cadet 2nd Class Andrea Hilario credited these types of events with helping her establish her own leadership identity.